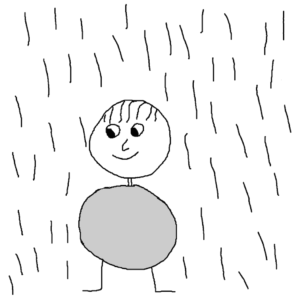 I was speaking at a lunchtime meeting when it started to rain. The shower fell from the heaven as if poured from a bucket. “Excuse me,” I said and left the room. I walked along the hallway, down the stairs, across the reception and out the main entrance until I came to a halt in the middle of the square outside the headquarters. I stood still and let the rain bombard my head. I enjoyed feeling the water trickle down the sideburns, neck, chest, stomach, thighs, shins and all the way down to my toes. After five minutes in the downpour I returned to the headquarters, through the main entrance, across the reception, up the stairs, along the hallway and toward the meeting room. The meeting was in full swing with a lively debate that stopped as soon as I opened the door, walked to the stage with a torrent of water trailing me and took up the thread where I had left it.